May 16, 2007 (Computerworld) -- The computer database infrastructure of Sarasota County, Fla., was attacked by a notorious Internet worm on the first day of early voting during the 2006 election, which featured the now-contested U.S. House race between Democrat Christine Jennings and Republican Vern Buchanan in Florida's 13th Congressional district. In the early afternoon hours on Monday, Oct. 23, 2006, an Internet worm slammed into the county's database system, breaching its firewall and overwriting the system's administrative password. The havoc brought the county's network -- and the electronic voting system which relies on it -- to its knees as Internet access was all but lost at voting locations for two hours that afternoon. Voters in one of the nation's most hotly contested Congressional elections were unable to cast ballots during the outage, since officials were unable to verify registration data. Washington, DC - Widespread “voter fraud” is a myth promulgated to suppress voter participation, according to a new Project Vote report released this week. “The Politics of Voter Fraud” finds that fraudulent voting, or the intentional corruption of the voting process by voters, is extremely rare. Yet, false or exaggerated claims of fraudulent voting are commonly made in close electoral contests, and later cited by proponents of laws that restrict voting. The report is authored by Lorraine Minnite, Ph.D., Barnard College, Columbia University. Analysis of federal government records concludes that only 24 people were convicted of or pleaded guilty to illegal voting between 2002 and 2005, an average of eight people a year. The available state-level evidence of fraudulent voting, culled from interviews, reviews of newspaper coverage and court proceedings paints a similar picture. “We shouldn’t base public policy on urban legends but on sound facts. It’s clear from this report that fraudulent voting isn’t threatening the integrity of our elections; we do know that erecting additional bureaucratic obstacles to voting discourages legitimate voters,” said Project Vote Deputy Director Michael Slater. The report includes case studies in which accusations of “voter fraud” received widespread media attention. Each one demonstrates the way in which partisan politics exploit administrative errors or minor problems to create the illusion of systemic fraud. While there is little evidence of fraudulent voting, the case is clear that voting rules restrict voter turnout. A recent study by the Eagleton Institute of Politics at Rutgers University found that laws requiring voters to show a document establishing identity reduce minority voter turnout. Researchers found that in the 2004 election, all voters, in states requiring voters to present documentation establishing their identity at the polls, were 2.7 percent less likely to vote than voters in states where no documentation was required. Latinos were 10 percent less likely to vote, Asian-Americans 8.5 percent less likely to vote and African Americans 5.7 percent less likely to vote. A survey by the Brennan Center for Justice at New York University School of Law found that 11 percent of Americans, more than 21 millions citizens, did not have a current government-issued photo ID. Low-income, minority and elderly Americans disproportionately lack current government-issued photo ID. To help improve public understanding and make the electoral system as efficient as possible, the report recommends: better voter fraud data collection and dissemination by states’ chief elections officers, maintenance of accurate voter registration databases, cooperative relationships between non-partisan civic groups engaged in voter registration and elections officials, education of the media, and the institution of automatic universal voter registration. Download "The Politics of Voter Fraud." The new state elections director's anecdote about personal brushes with voting fraud have riled a number of county clerks and left others scratching their heads. At a meeting of county clerks in Santa Fe on Jan. 23, Daniel Ivey-Soto recounted several conversations he'd had over the years with people who told him they'd used other people's identities to cast multiple votes, according to Ivey-Soto and others in attendance. "I have been in conversations with people who have told me that, at various times, they've voted more than once on Election Day," Ivey Soto said in an interview this week. "It happens. Apparently some people were shocked by that." Santa Fe County Clerk Valerie Espinoza, a Democrat, was one of them. "To make those comments to a group of county clerks was really just unbelievable," she said. "As a lawyer, he knew that voting fraud is a felony, and if you know someone who does that, why don't you tell the attorney general?" Otero County Clerk Robyn Silva, a Republican, echoed those comments. "It kind of puts in motion the question, why didn't he do something about it?" she said. "Now he's going to be the elections director for the state?" Other clerks said they thought Ivey-Soto might have been joking. Ivey-Soto, who took over as election chief three weeks ago despite having no experience running elections, said he recounted the conversations to make a serious point. "In any system where people are allowed to express their opinion, you're going to get a certain amount of fraud," he said. "On `American Idol' you get people who call in to vote 16 or 17 times." He said the conversations about voting fraud happened more than three years ago and suggested some may have been protected by attorney-client privilege. Chris Atencio, political director for the state Republican Party, said Ivey-Soto had a responsibility as an officer of the court to report any knowledge of criminal behavior. "It's something that would have been illegal not to report," Atencio said. Ivey-Soto is a former general counsel for the state Democratic Party. He said he is taking firm steps in his new role to minimize voting fraud. "I don't have a cavalier attitude about these issues," he said. "If some people got that impression, that's an unfortunate impression." A new report, based on official 2004 and 2006 New Mexico election data, shows a dramatic difference in undervotes in Native American and Hispanic precincts, depending on whether they voted on paper ballots or on Direct Record Electronic (DRE — often known as touch screen) voting machines. 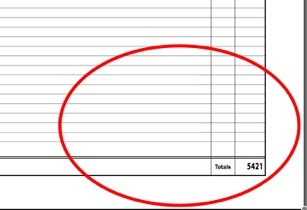 The report explains: "Undervotes represent ballots on which no vote was registered for a specific contest. Undervote rates higher than 0.5% in the major contest on a ballot, especially in presidential elections, suggest that votes may not have been counted, either through a mistake of the voter or a mistake in tabulation." The report shows that in predominantly Native American and predominantly Hispanic precincts, undervote rates were abnormally high (7.61% and 6.33% respectively) in the 2004 presidential race, when the votes were cast on DREs. Link: lamonitor.com: The Online News Source for Los Alamos. Revisiting a motion that had narrowly passed by a 4-3 vote last month, Los Alamos County Council rescinded funding for the purchase of 17 Sequoia Pacific "Edge" touchscreen voting machines by a vote of 7-0 Tuesday.Councilors Nona Bowman, Diane Albert and Mike Wheeler opposed the original motion on Oct. 28. At a meeting Nov. 4, Councilor Fran Berting asked councilors to support her motion to revisit the issue. They voted 5-2 to do so with Councilors Geoff Rogers and Jim West opposed. In light of newly received information, Berting sought an opportunity for further discussion on the voting machines, as well as an opportunity to change her vote. The 17 machines would have been purchased by the county as back-up machines for each of Los Alamos' precincts. The State of New Mexico has already funded the purchase of 19 "Edge" touchscreen voting machines for Los Alamos through federal funding received as part of the Help America Vote Act.The HAVA was enacted shortly after the presidential election of 2000 when discrepancies in Florida called the count into question. Among its requirements is the provision of voting machines for the visually impaired so that they may vote independently without personal assistance. Here is another example of a differing vote counts. 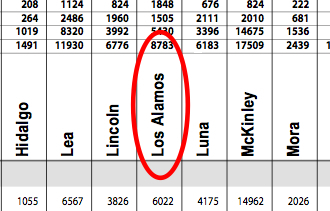 But according to The Statewide Canvas, the number of votes was actually 8,783 Total Voters for Los Alamos County. This letter to the Editor appeared in yesterday's Santa Fe New Mexican from Robert Stearns and Paul Stokes, of United Voters New Mexico regarding SB 179 a bill that would establish new standards in voting accuracy for New Mexico. Thanks to the vision of the Legislature and the governor, New Mexico is now a leader among states in the trustworthiness of its voting system -- voter-marked paper ballots counted by optical scan machines. What validates voter confidence is that the paper ballots are preserved for checking machine accuracy, and for ready recounting when tallying mistakes are suspected. But to match our new paper-ballot-based voting system, the mandatory random audit of election results in the current law now needs strengthening. SB179, introduced by state Sen. Cisco McSorley (D-Albuquerque), would institute a procedure ensuring that the random selection of optical scanning machines to be audited would provide a very high statistical probability of catching any faulty machines. This issue directly affects our citizen's right to election result accuracy, both as voters and as candidates. SB179 merits all-out support.